Alan Syliboy doesn’t believe in boundaries between art forms. Depending on the day, the Millbrook-based creator could be working on a painting, a print, an illustrated drum, animation, a book project, playing music, or weaving it all together into a multi-media presentation. The unifying factor is a passion for presenting Mi’kmaq stories, underlining the ancient connection between nature and mankind, in a vibrant and innovative fashion that speaks from his own heart as well as the hearts of the First Nations. “It was the perfect time, I was in my teens and Shirley was recruiting for an art project in the United States, with native teachers giving workshops on reserves, and that’s what I did. It was a great opportunity that was a major life-changer. If that hadn’t happened, I don’t know that we’d be here talking about art today.” Following his early instruction from Bear, Syliboy attended the Nova Scotia College of Art and Design in the mid-‘70s, an experience that “expanded the whole universe for me” as he encountered artists from around the world, in all disciplines. In recent years, his path has taken him even further into native Nova Scotian folklore, illustrating The Stone Canoe: Two Lost Mi’kmaq Tales in 2007, which inspired further artwork featuring The Stone Canoe’s featured character Little Thunder. Besides co-writing the song Little Thunder for his band Lonecloud, Syliboy also collaborated with filmmakers Nance Ackerman and Paton Francis on the animated National Film Board short Little Thunder for the 2010 Winter Olympics and created the graphic novel telling of the tale, The Thundermaker, inspired by indigenous petroglyph rock etchings. 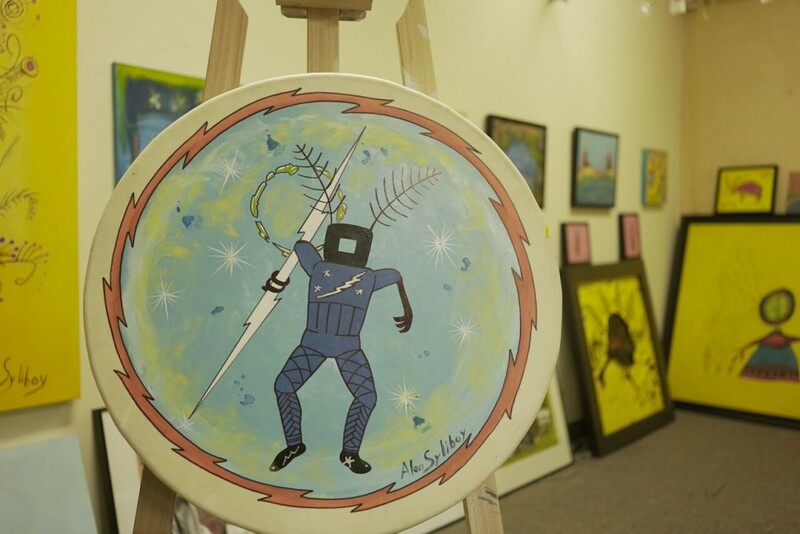 From October, 2014 through March, 2015, Syliboy paved the way for the book by going on tour, taking a multi-media installation for Thundermaker with illustrated panels and a tipi where visitors viewed the National Film Board film to 11 libraries around the province. The traveling series was made possible by a grant from Support4Culture, funded by sales of designated lottery tickets from the Nova Scotia Gaming Corporation. The funding programs are managed by the Department of Communities, Culture and Heritage. In this case, the grant allowed the artist to take the tale of Little Thunder to a whole new audience. Syliboy was delighted and inspired by the feedback he received from the tour. “There’d been nothing really like it before, especially in the libraries themselves. A lot of the communities really don’t see any native art that much, especially at the scale we were doing it,” says Syliboy, adding that the help from Support4Culture allowed him and his team to create a traveling exhibit that could work in a variety of different sized spaces. Syliboy hopes The Thundermaker will inspire Nova Scotians to explore Mi’kmaq culture further, and help his own community feel a closer connection to its own past.